There is something incredibly soothing and spiritual about burning wood. It provides heat, of course, but it also provides entertainment as I never get tired of watching the flames. I grew up with a fireplace, the first house I purchased had a fireplace, and while I do sort of miss the open-ness of a fireplace, a woodstove is a pretty good consolation prize. The woodstove we have is a very efficient, as well as aesthetically pleasing, model and we bought it 10 years ago when we got married. It seemed right for our first major purchase to be something that would be a source of heat and comfort for our family for many, many years. While heating with wood doesn’t necessarily save us much money, it provides a warmth that’s comforting and soothing and it pleases us. Well, it pleases me. I’m not the one who stacks the wood and carries it into the house. I’m not the one who gathers kindling and starts a daily fire in the fall when it’s not cold enough to keep the fire burning all night but not warm enough to not have a fire at all. And I’m not the one who gets up in the night to check on the fire and add wood. I’m just the one who sits by the stove and enjoys the comfort and warmth. Old fashioned, for sure. But we I wouldn’t have it any other way. I can almost feel the warmth. We had a wood stove when I was a child and it was soothing. Of course I didn’t tote the wood… My mother’s memories aren’t as fond. your wood stove is lovely. i wish we had one — our next house will have a woodstove or fireplace. i love the smell especially on a cold november day. Great “W” post. Do you add water to the kettle above to add humidity to your home in the winter? Or is it for hot water for hot chocolate and tea? Very cozy indeed! Just looking at it makes me feel warm in this cold archives I am in now! I grew up with a wood stove and just loved it. We have a fireplace in our house but there is something wrong with it we haven’t figured out yet. The whole house reeks of smoke after we use it. It’s yucky. I hope we get to use it this year. I’m feeling warmer already! I can almost hear the *crackle* of the flames! Ya know, if I had a Dale, I’d probably still use my woodstove, too. D’you think he could stop by my house every day to tend the stove for me? Ah, woodstove memories. When I used to bring the kids to the cabin on winter weekends, we’d get here Friday night, the cabin would be 45 degrees, and the first thing I would do was to start a fire in the wood stove. I’d put the kids to bed, and sit and read with my feet on the fender. We still have that woodstove as auxiliary heat, since the geothermal has a hard time keeping up when it is -20 degrees F. outside, but it’s in a different location now, not so inviting. 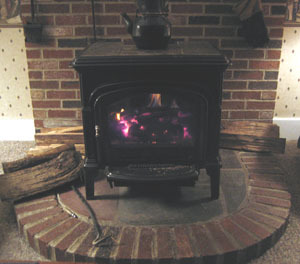 We used a soapstone wood stove to heat the house in VT. Not much use out here in the west where wood is more expensive than oil, but I miss the warmth of that type of heat! Great post. My parents had a wood stove in a house that they used to own in New Hampshire. I have fond memories of sitting in front of it on cold days. Your woodstove is fantastic and rustic, I love it! We looked at a house recently that had one and I fell in love. Our gas fireplace is nice and warm too, without the work of wood hauling and kindling and all that. You want fire? Flick a switch. Not very rustic, eh? I’d rather have your woodstove any day! Lovely. I haven’t had a wood stove in quite a while, and I do miss it. I absolutely love a fire – it’s so soothing and homey. But, I’m with you – Travis does all the work, I just get to enjoy. Unfortunately our woodstove doesn’t have a window on it but I DO love the SOUND of the fire and the fact that you can just sidle on up to it and warm yourself through and through….and the fact that, if we get our own wood rather than buy it, our heating bill is only the price of a wood-cutting permit: as low as $20 a year! I, too, have a whole post about this rattling around in my head that will someday spill out onto the computer. A wood store has so warming and comforting. The smell of burning wood is rich. What a lovely place to sit and knit. my dad used to make our breakfast on the woodstove–cream of wheat, maypo, wheatena. it is a wonderful memory! cleaning the chimney though–not a pleasant memory. stacking wood–even worse!! Mmmm . . .cozy . .. we HAVE a fireplace, but Dad hasn’t let us light a fire in years (1977, I think?) because it’s so energy INefficient. Sigh. We have candles in there now . . . at least it’s some kind of flame! There’s nothing like sitting next to a woodstove and knitting away! My family growing up (in NH) heated the house by woodstove. It was fraught with hassle (my sister and I were hauling logs pretty much from the time we could walk), but there is nothing cozier than sitting in a room with a woodstove. When my stepmother moved in several years ago the first thing she did was order a new heating system for the house, and while it was absolutely the right move for so many reasons, I do sometimes feel a little sad when I come home for Christmas each year half expecting a toasty fire to be burning away but then seeing the dried flower arrangement sitting on the now-unused woodstove. Okay, and I totally made this about me. But I loved your post! DD Nikki would certainly agree with you, complaining when we moved to a place without wood heat after 13 years that she couldn’t get warm enough! We still have a small woodburner in our kitchen and mainly wood heat at the high country house where the kiddos grew up, but don’t miss that hunt for enough wood for the whole winter each fall that we used to go through. We have a woodstove also. The last house we were in, we had two. I do agree with Birdsong, the hunt for wood each year gets old, and then the middle of winter worry that we may run out is no fun either. How wonderful – knitting in front of the fire. Doesn’t get much better than that. Oh, I suppose you could be sipping a little something. Just another reason to love him, hunh? 🙂 Did the fireplace dais come with the house or did you have it put in when you go the stove? So cozy! I’ve never had one but you know we are looking to move and a colder clime is in order…maybe I can get a wood stove so I can sit and read/knit in front of it.